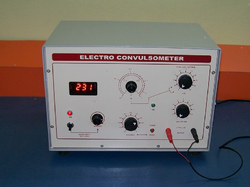 Electro Convulsometer is used for applying maximal electro-shock through corneal electrodes provided. Provide 50Hz alternating current stimulus for producing minimal and super maximal seizures required in the assay anticonvulsant and epileptic drugs complete with one pair corneal electrode 4, 6 or 8mm cups, and one pair of ear clips work on 220 A.C. This instrument is used for applying Maximal Electro Shock (MES) through the corneal electro rods provided with the instruments. It is used to study the anticonvulsant activity of phenytoin against Maximal Electro Shock induced convulsions in rats. This instrument has been designed with the modern state of art technology incorporating MSI electronic circuitry. 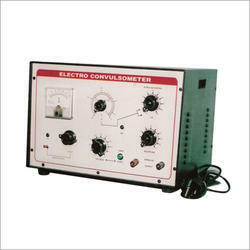 The MEDICRAFT ELECTRO-CONVULSOMETER is one of the basic instrument for the Pharmacology laboratory of Medical Colleges, Pharmaceutical concerns and Research Institutions, which are devoted to the study of Anti-Convulsant and Anti-Epileptic drugs, whether for education, screening or manufacturing of drugs. Medicraft Electro Medicals Pvt. Ltd.
Use: Cerebral seizures are produced using constant sinusoidal alternating current to determine the effect of anticonvulsant drugs.